BAGHDAD (AP) — The dirt mound in the dry hills outside the village of Badush was known as a place where Islamic State fighters had buried some of their enemies after they overran much of northern Iraq nearly four years ago. But it was only when Iraqi authorities began digging last summer that the identity of the victims became clear. They found the bodies of men with long black hair and silver bracelets known as karas that are worn by followers of the Sikh religion. On Tuesday, India's foreign minister confirmed the mass grave contains the bodies of 39 Indian construction workers abducted shortly after the area fell to the extremists. Iraqi and Indian authorities said 38 of the bodies had been positively identified through DNA analysis. All were Indian, and all had been shot, many in the head. IS likely killed them for their religious beliefs. DNA analysis has not been completed on the last body. The killing was a "heinous crime carried out by Daesh terrorist gangs," Najiha Abdul-Amir al-Shimari, the head of Iraq's Martyrs Establishment, told reporters, using an Arabic acronym for the group. Those killed were "citizens of the friendly Indian state. Their dignity was supposed to be protected, but the forces of evil wanted to defame the principles of Islam," said al-Shimari, whose government body documents those killed by IS. While authorities have not said when they believe the group was killed, the bodies were badly decomposed and had clearly been buried for a long time, Iraq's forensic director, Zaid Ali Abbas, told The Associated Press. He also described how the men had been shot. The workers, most from northern India, had been employed by a construction company operating near the northern city of Mosul. Around 10,000 Indians lived and worked in Iraq at the time. In the first days after Mosul was captured, their relatives back in India began to receive panicked phone calls, with the men begging for help. "Tajinder spoke to us once on the phone after he was kidnapped," said Tevinder Singh, whose nephew Tajinder Singh was among those killed. "We never heard from him again." She said the Indian government did not contact the family to tell them his body had been identified. Instead, they got the news when Foreign Minister Sushma Swaraj announced it in a Parliament speech on Tuesday. Dozens of mass graves have been discovered in territory once held by IS, though Iraq's government has only been able to examine a handful of them. Iraqi officials say they lack the resources and trained personnel to properly exhume so many sites. At the height of its power, IS controlled nearly a third of the country. In recent years, Iraqi forces backed by a U.S.-led coalition have gradually driven the militants from all the territory they once held. The area around Badush was retaken last summer. Search operations led to the mound of dirt near Badush, where local residents said bodies had been buried by IS, Swaraj said in Parliament. Forty Indians were captured by the militants, though one man managed to escape. "It is indeed a moment of deep grief and sadness for us," India's ambassador to Iraq, Pradeep Singh Rajpurohit, told reporters in Baghdad. "India strongly condemns terrorism in all forms and manifestations and stands in solidarity with the government and the people of Iraq in their fight against terrorism." He said the bodies will be sent back to India "in a couple of weeks or so." Harjit Masih, the only Indian survivor, has long said the rest of the group had been killed. He said they had all been held for a number of days, then taken outside and ordered to kneel. Then the militants opened fire. 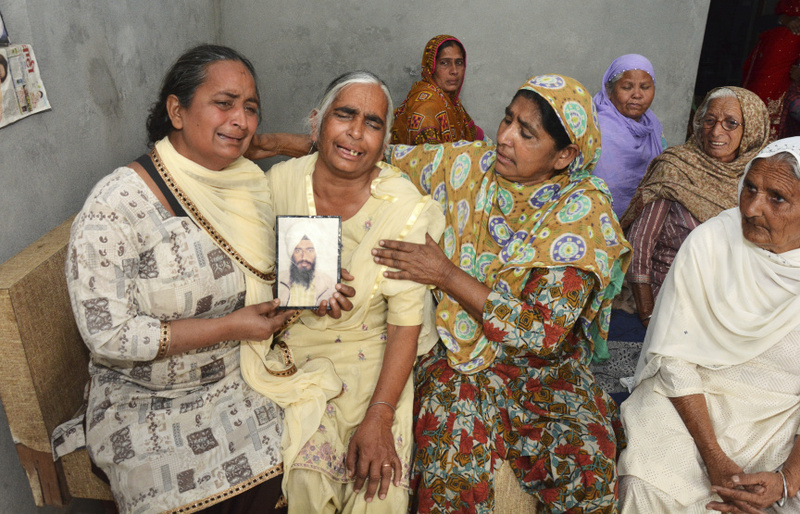 "They were killed in front of my eyes," he told reporters Tuesday in his north Indian village. He was shot in the thigh but managed to escape. Iraq, which is in the midst of an economic crisis, is also struggling to rebuild after more than three years of grueling war against the militants. The fight against IS has cost Iraq more than $1 billion in destroyed infrastructure, officials say.